Ingredients: Carrots / Cucumber / Mango / Spring Onion / Jump prawns / Masala powder / Onion / Splash of pineapple juice. 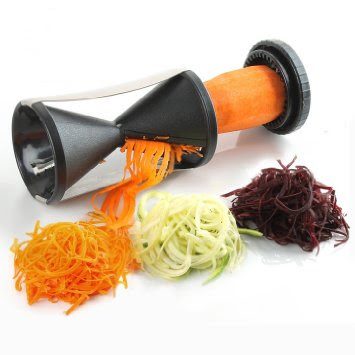 Before you go shopping to get the handful of ingredients required, you first need to invest in a secret weapon AKA the Spiralizer!As you can see the spiralizer is like a pencil sharpener for vegetables - they're great for salads and turning vegetables into low card spaghetti. I picked mine up in the Travola kitchen store (I think that's the name) in The Springs shopping centre and cost 99dhs. Otherwise they're easy enough to buy online. It's such a health dish which is also really filing - also goes down very well at BBQs!